The interest to a research of the factors affecting the development of the machine-building and metal-working industry is connected to a research of the influence of institutional factors on the sectoral composition of the economy in a natural resourcerich region. The initial data are the results of the questionnaire survey and statistics. The research is focused on the factors of the evolution of the machine-building and metal-working industry in a natural resource-rich region. We analyse factors influencing the development of this industry in Khanty-Mansi Autonomous Okrug — Yugra. The purpose of the study is to identify the factors that influence the development of the metal-working industry under crisis and sanctions. Our hypothesis is that the machine-building and metal-working industry in Yugra derives from oil production. The basic methods are questionnaire survey and economic and statistical analysis, in particular, the multiple correlation method and autocorrelation method. We have found the influence of informal institutions on the development of the industry. Moreover, we have revealed the most important factors and tendencies for the development of the industry. The machine-building and metal-working industry remains dependent on the rate of national currency, however the dependence on oil prices. The results of the analysis demonstrate that informal norms and rules have both positive and negative impact on the development of the industry. The most important positive factors are the level of competition in the industry, state strategy for the development of the industry. The most important factors that negatively affect the development of the industry are: skill level and composition of labour resources, geographical location of the region. There is a tendency of enterprises consolidation and the increase in labour productivity, a growth of capital intensity of production, positive influence of inflation, and increase in the role of export. The dependence on the rate of national currency remains, and the dependence on oil prices can be considered to be overcome. The scientific contribution consists in revealing the influence of informal institutions on the development of the industry, as well as in the identification of interdependencies and trends, which are difficult to explain. We have concluded that the machine-building and metal-working industry derives from the leading industry of the region — oil and gas production, and its development is increasingly defined by internal factors. The results can be applied in public administration at the regional level, as well as for legislative adjustments and further scientific research. 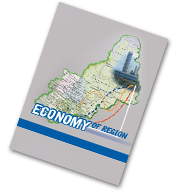 The question of what is primary — regional economic institutions or whether the economic development of the industry in the region, remains contentious and can be considered as a limitation or direction for future research.